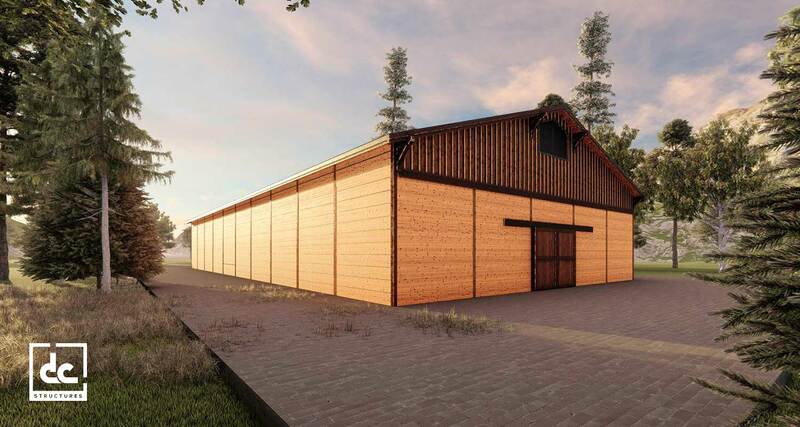 The Frontier indoor riding arena is a fully indoor equestrian facility designed for year round riding. This clear span structure features high-quality cedar and Douglas fir siding that will add value and interest to your property. This kit is designed with durable wood posts and angle-iron steel trusses, this arena doesn’t just look beautiful, it’s simply a better investment than a metal building. With a skilled builder and proper maintenance, this elegant arena will serve generations of equine lovers. The Frontier arena kit has a timeless and dependable design that allows for countless options and upgrades. 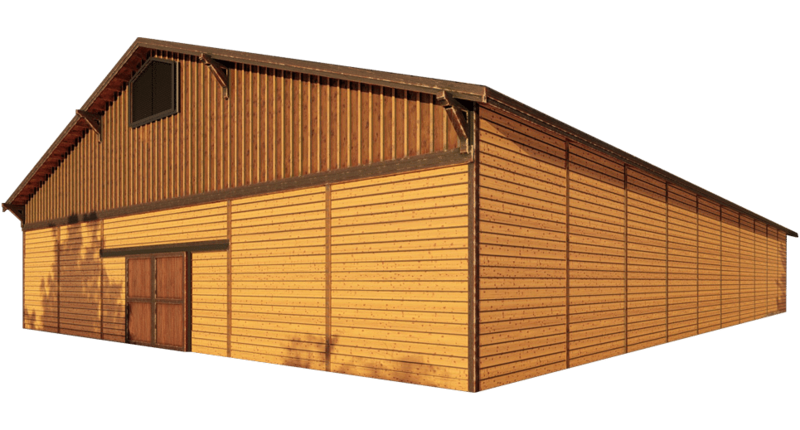 From barn wood to horse stalls, you can customize your kit to accommodate all of your equestrian needs. 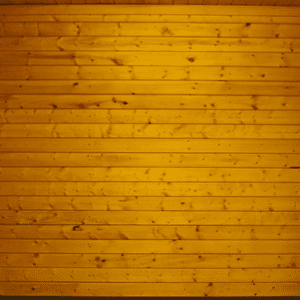 A standard offering for all of our horse barns, and a frequent upgrade for interior wall and ceiling coverings on our barns and homes, we only source the finest select grade 2” x 6” Douglas fir from the Pacific Northwest. Douglas fir takes a finish well and can be matched with a variety of vibrant stain colors. 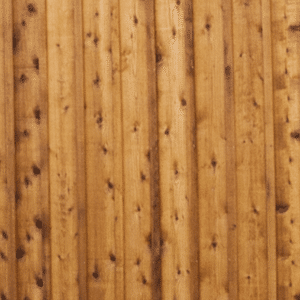 The standard offering for all of our barn homes, cedar board and batten siding is a beautiful, rustic, long-lasting siding choice featuring vertical 1” x 10” visual grade, tight knot western red cedar board and 1” x 3” battens, planed smooth on one side and both edges. An optional upgrade from our standard Douglas fir tongue and groove offering, western red cedar is known for its rich color, straight grain, and its natural resistance to the elements, a good match for those looking for a natural but durable wood aesthetic. 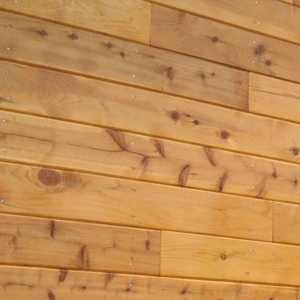 The latest development in wood siding, DC Barnwood is brand new cedar siding that has been treated to resemble reclaimed barn wood. 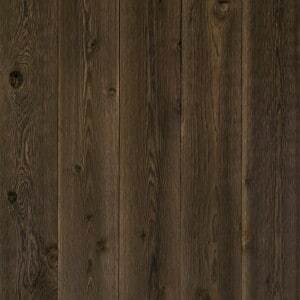 Less expensive than authentic reclaimed wood and much easier to obtain in large quantities, DC Barnwood is available in over a dozen colors and is designed to age naturally without maintenance. COMES IN A VARIETY OF DIFFERENT FINISHES. CONTACT US FOR MORE INFO. This fiber cement siding product designed to imitate classic board and batten siding is more fire resistant than wood and requires much less maintenance. Available in four textures including stucco, HardiePanel products come with a 30-year transferable warranty. 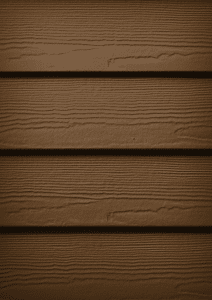 This fiber cement siding product designed to imitate wood lap siding is the most popular brand of siding in America. 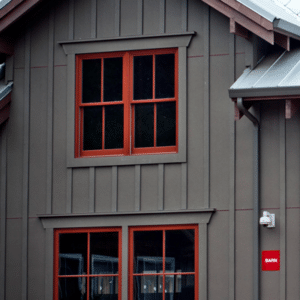 Available in over a dozen colorful finishes or primed for paint, HardiePlank is among the strongest and best performing siding types on the market. Our window cupola comes standard with our Oakridge and Sunnyside series. 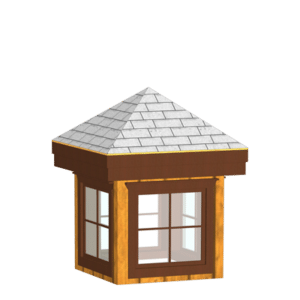 This cedar cupola measures up at 36” x 36” with a 9/12 pitch and comes with four fixed Andersen 100 series windows, cedar trim, window tape, and flashing. Our basic barn cupola comes standard with our Columbia, Powell, and Pendleton series. 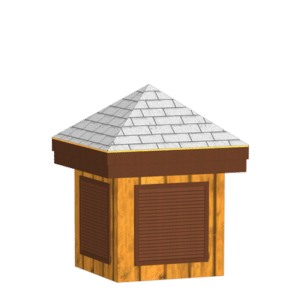 This cedar cupola measures up at 36” x 36” with a 9/12 pitch and comes with cedar louvers. Somewhere between a standard kit design and a custom build, our Flex Design option enables you to make structural adjustments that honor your vision more fully. This includes fundamental changes to the building such as height or width, removal of posts, changes to roof pitch and custom upgrades like a deck or covered porch—all for less than a custom build! Each of our kits has been predesigned to a certain sidewall height. But when our clients want to use their kits for the storage of large recreational vehicles or commercial equipment that exceed our standard building height, we can raise the second level of your building to meet your needs. Most of our post and beam buildings are designed on a grid with a structural post every 12’. This system takes advantage of the standard lengths of dimensional lumber to maximize the efficiency of your building and reduce waste. Some clients prefer a floor plan with an atypical building width requiring larger or smaller spans between posts. These changes can be accommodated with a custom structural upgrade. The post and beam building system relies on structural posts that eliminate any load-bearing walls, allowing our clients to design highly customized floor plans. However, some clients may want to remove one or more structural posts to create larger open spaces. 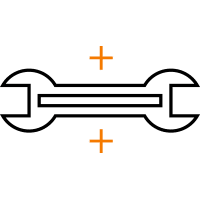 These changes can usually be accommodated with a custom structural upgrade that increases the size of other posts, beams, and connection hardware to compensate for the missing posts. At DC Structures, we pride ourselves on offering our clients the ability to make more customizations than any other building kit company. True customization means more than giving you some of the best windows, doors, equestrian equipment and building materials to choose from, it also means allowing you to make certain structural modifications to your building. Our kits are shipped from the Pacific Northwest to their final destination via flatbed truck. 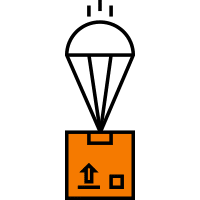 A unique shipping quote is created for each client, based on the size of their building kit and the location of their construction site. Live outside the lower 48? No problem! We can create a custom shipping quote and send your kit anywhere in the world. Please speak with one of our design specialists about our warranty. Our sturdy buildings are pre-engineered to meet a standard set of criteria that will meet county regulations almost anywhere. 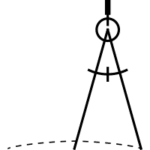 However, if you live in an area with unusually stringent codes, particularly at high elevations, our standard building kit may not be sufficient. DC Structures can accommodate these loads by making changes to your kit, usually by increasing the size of structural posts and beams. 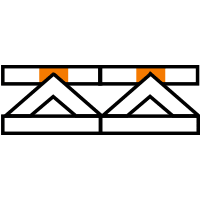 Our building kits with second story living options are designed with a simple floor system using 2” floor joists, but we recommend that many of our clients upgrade to an open web floor truss system. This truss system means you’ll never have to drill a hole through a joist to install plumbing, electrical, or HVAC systems. If you love the heavy timber look, ask your design specialist about a heavy timber framing upgrade to the loft or roof of your building kit to create a more rustic and handcrafted aesthetic. 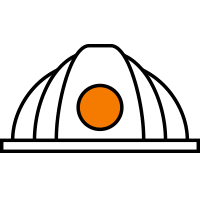 Many of our clients with construction experience act as their own general contractor, saving tens of thousands by putting in their own sweat equity. 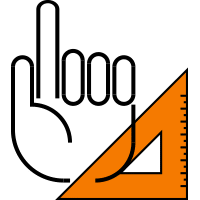 If you know a builder that you trust, we’ll set them up with our best-in-the-industry blueprints and help guide both of you through the process. Remember that every DC Structures kit comes with support from our team of builders with real post and beam construction experience. 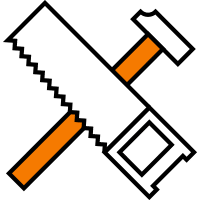 Need help finding a builder? We have a nationwide network of trusted builders who understand this construction style. 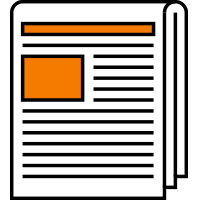 We’ll help interview and vet your contractor to make sure they’re the right fit for your project. 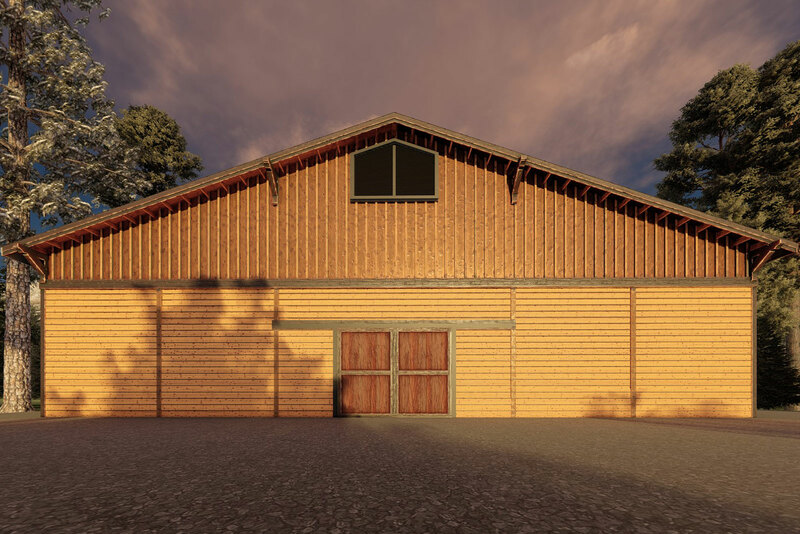 Although they don’t have to capacity to handle every DC Structures project, our sister company DC Builders constructs a certain number of barn kit projects every year. Ask your design specialist about getting a construction quote from DC Builders. The Frontier riding arena kit comes complete with a comprehensive materials package. Our kit collections have been carefully designed to accommodate any purpose or function. Explore our other barn kit options to find the best fit for you.